I need to be as frugal as possible and one of my best sources of yarn is cheap sweaters from the thrift store. Sometimes they're available for a buck and you can't beat that price. A little elbow grease goes a long way on this type of project. The last set of towels was also made with yarn from what were once sweaters. Here's one I picked up not too long ago, I really liked the blue color. My aunt saw the yellow towels that I made and wanted 4 of them. I didn't have enough yellow but I showed her this and she liked it too. This picture shows the color the best. 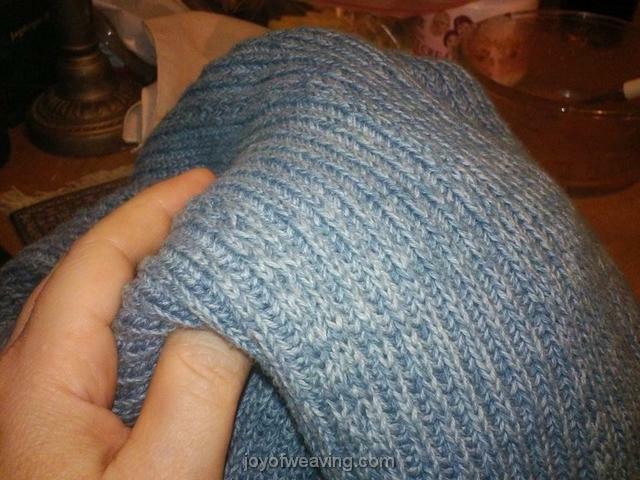 Here's the sweater before I unraveled (frogged) it. Here's the towels I wove with this yarn, I just now removed them from the loom. Tomorrow I'll wash, dry, cut them apart and then finish off with a rolled hem. 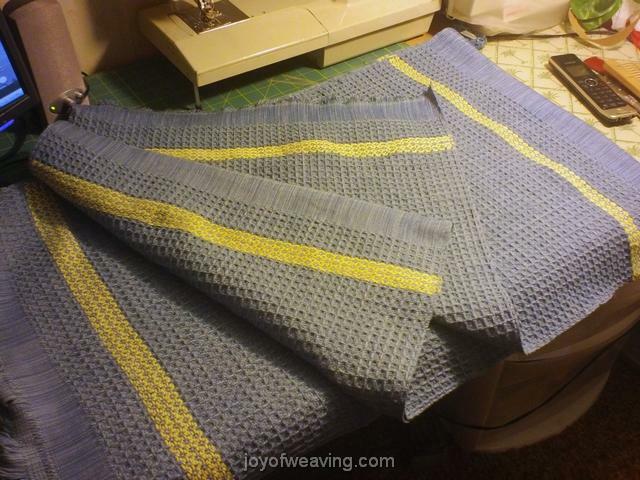 I used Invisible Fusible Thread between the towels and plain weave with sewing thread where the rolled hems go, to reduce the bulk. UPDATE: Here they are all finished and ready to mail out. Gotta love that invisible fusible thread. I did 6 picks between the towels and after wet finishing, I simply cut on that line. No fraying means quick and easy rolled hems.